It doesn't matter. It's a story we all know. I've seen countless other films with the same essentials. On my mind, specifically, is the underseen 2003 Kevin Costner western, Open Range. The said essentials, in the case of this take on the story, are that a ruthless robber baron called Bartholomew Bogue (Peter Sarsgaard) and his group of thugs, mostly town lawmen, terrorize a small village in California circa 1880. 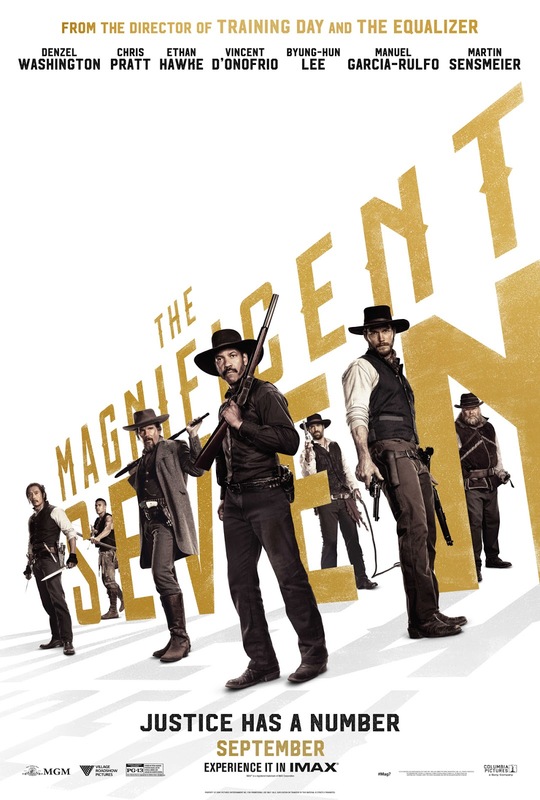 After Bogue murders her husband in a chilling, masterful opening scene, Mrs. Emma Cullen (Haley Bennett) sets out to find the best of the best, a bounty hunter called Chisolm (Denzel Washington), who she thinks may be willing to take on Bogue's army and restore peace to the townspeople. Of course, he won't be able to do it alone, so Chisolm assembles a team, equal parts gunslingers and outcasts, to help him out. Chisolm never misses his shot, to be sure, and he instantly finds Josh Faraday (Chris Pratt), a card-playing, hard-drinking gunslinger, who helps him and Mrs. Cullen track down the rest: the Confederate rifleman, Goodnight Robicheaux (Ethan Hawke); his knife-wielding sidekick, Billy Rocks (Byung-hun Lee); the frontiersman Jack Horne (Vincent D'Onofrio); the lone Apache warrior, Red Harvest (Martin Sensmeier); and Chisolm's next bounty, the Mexican sharpshooter, Vasquez (Manuel Garcia-Rulfo). All fit the bill. All look the part. And all seven bring a particular expertise with a personality to match and, in unusual form, given the overloaded summer messes known as Batman v Superman (which I didn't see) and Suicide Squad (which I sort of liked), are given pretty much equal time in terms of setup during the inevitable roundup sequence. It slickly glides along, interviewing with kills. If my love for Denzel Washington, the action hero, didn't fully get me through the door on this one, then it was Chris Pratt who did. There is nothing that dude can't do. But never did I expect to be so in awe at the reunion of Washington and Ethan Hawke here again with director Antoine Fuqua, such a perfect trio in Fuqua's 2002 crime drama Training Day. I was actually giddy when they showed up in the same spot. Then, Vincent D'Onofrio shows up. And he steals the whole show. His fat, bearded, coonskin cap-wearing Horne is comic relief, voice of reason, and mastermind. D'Onofrio plays him with this sort of off-beat rhythm, every word hanging on a high-pitched release. It's actually hilarious. Then, he becomes the man with the plan, and we sense we are in good hands, even when the script goes to the inevitable "planning session," where the characters tell us what's going to happen, leaving out just enough to keep us surprised here and there in the final act, a classic western shootout easily as fun as you'd expect. There's some great pacing at work in The Magnificent Seven that sets it up there as one of the year's best action movies. And it looks great. The best thing about The Magnificent Seven is that it made me want to go back and watch the films that inspired it, and maybe even some of the films those films already inspired, at least the ones I haven't seen. I suppose something like this still works because it's comfortable, which, in this case, just isn't a bad thing. I saw it on a Friday night, a date with my wife. We laughed. We hung on in suspense. We escaped. It may not be as profound a statement as some of the recent westerns, like, of course, Tarantino's last two, both of which leave plenty to be desired in their own right. It definitely isn't in the same league as this year's modern day western, Hell or High Water. And it is certainly not original. But it's fun. And that, as it turns out, is exactly what I was looking for. I thought it was pretty good. However, there were a few things that I didn't agree with, & I do agree that the final seconds did leave a bit to be desired. But it was definitely what I wanted it to be: a fun, action-filled Western. I also agree that it's definitely not as good as the masterpiece that was Hell or High Water, but it was pretty good. But I do respectfully disagree with you on the mention that Tarantino's last films leave plenty to be desired. I loved both Django Unchained & The Hateful Eight. The Hateful Eight was better than Django Unchained, in my opinion, but they are both some of the best Westerns of the century. I see why you think both leave plenty to be desired, but I thought they were both excellent. I just want Tarantino to make something a little less vile than The Hateful Eight. I haven't seen this yet but I am hearing good things about it mainly that it's fun. Funny that Washington and Hawke were in that gritty film, Training Day. It's a lot of fun. Nothing more, nothing less. I wanted to put Seven Samurai on my 2017 Blind Spot list, but that runtime scared me off too. I barely like Westerns as it is. I'll probably wait for DVD for this. Haha! I think about it every year. Same thing. I am actually going for it though. It's on deck in my Netflix queue. Gonna break it into three or four sittings. I could count the number of Westerns I've seen on one hand, it's really not my genre, but dang-it the trailer for this movie is really selling it to me! I'm going to have to watch it for sure. Great review! I'm coming to really love Westerns. I have been watching them regularly and really enjoy the atmosphere, even if they get a bit boring at times. This one isn't boring in the slightest. See it. Thanks! I'm so here for D'Onofrio stealing scenes because, I love him, but...this movie just looks like something I'll forget was even released next week and won't regret never watching. It's fairly forgettable, but then again not because you already know the story so well. It then just becomes a huge showcase for action sequences and charming actors. D'Onofrio the most of which.